The idea was to have a dry run (pun intended) for a 300km ride I was hoping to turn in to an Audax event for 2013. I will need to move the starting point further south, but on this day I would start the Garmin at our usual meeting point of Cottingham Green. But first I had to get some sleep and, after going to bed later than intended after the delay to that rugby league match (Hull FC lost, by the way) I was restless, nervous even. I really don't know why; this wasn't a competition, just three blokes doing a long ride. I woke on the sofa at 2:15am and wouldn't sleep any more that day. At 4:20am I set off into a heavy – and not at all forecast – mist. Lights and hi-viz vest on. After picking up Steve we met Dave and left Cottingham shortly after 5:00am and followed the familiar route to Etton. After there we skirted Market Weighton, Pocklington and Millington as the sun began to appear. After crossing the A64 we kept to the ridge and headed towards Leavening and North Yorkshire as the mist returned to coat our clothing with fine droplets of moisture. We couldn't see the distinctive church at Bugthorpe as we passed below it on the road to Malton and our first stop on some steps outside a shop opposite Morrisons. After our morning break we went westward on the road towards Coneysthorpe, but turned right and crossed the B1237 at Amotherby. At this point the route was unknown to me. It was surprisingly busy and, until we went over the A170, poorly surfaced in parts. 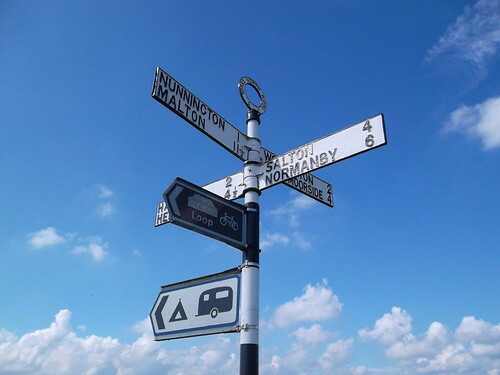 Most of the miles after Malton to the A170 passed through the Vale of Pickering, a welcome flat section after the lumpy north western Yorkshire Wolds and before the steady climb through the North York Moors. Normally I would have liked to stop at Hutton le Hole, a picture postcard village with a tea shop that was temptingly open. 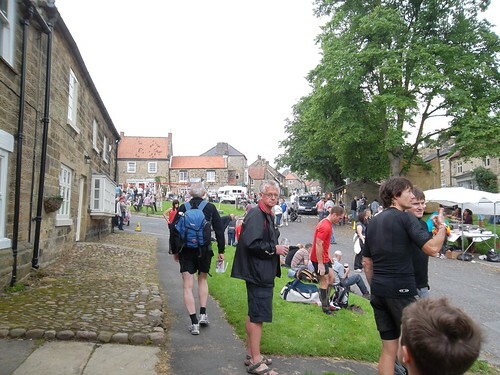 However, Malton wasn't long behind us and we made use of the slight tailwind as we started the climb out of the village and on to Blakey Ridge. I hadn't taken too much notice of the profile of the ride here, and perhaps that was just as well. 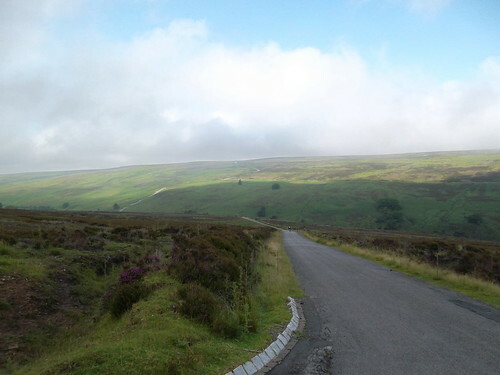 It was a long, steep drag for the best part of eight miles over the North York Moors. The Lion Inn marked the end of the climbing (well, nearly) and on another day it would have been a pleasant place to stop. But we kept moving and disassociated from the strain of the ride by counting dead sheep and by Dave trying to explain this jet stream business to me. We turned off the Moors road towards Westerdale and took the alarmingly steep road in to this little village that sadly no longer has the Youth Hostel I stayed at many years ago. The climb out is just as stiff, and Dave left me and Steve for dead. I let them both get further ahead as I stopped to take the photograph below. After the ford the road is very steep and very long to the top. Eventually we made it to Kildale and the tea room there. I was desperate for a cup of tea and beans on toast. Steve is originally from this area and pointed out the hill climbs he had ridden as a youth. At some stage we were overtaken by a car when there was no room. The driver of the car on the opposite side of the road had to pull to the side and stop as the impatient motorist sped towards him. In fact there were a few impatient motorists in these parts. There was a considerable number of cyclists, too, which was rather more pleasant to note. 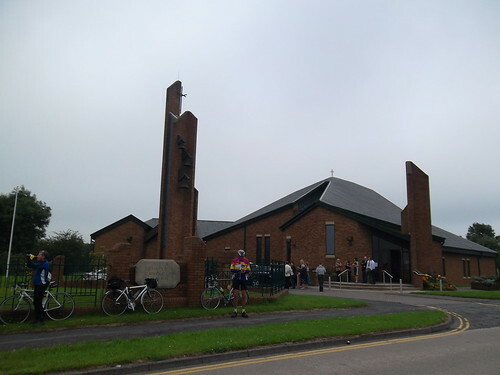 After sweeping through Great Ayton (and then coming back and picking up the route again) we passed through Seamer and along part of the return route to Coulby Newham and our furthest point of Middlesbrough Cathedral. We didn't stop long and set off back. Steve would leave us near Middlesbrough to stay at his mother's home for the night before returning to East Yorkshire the following day. 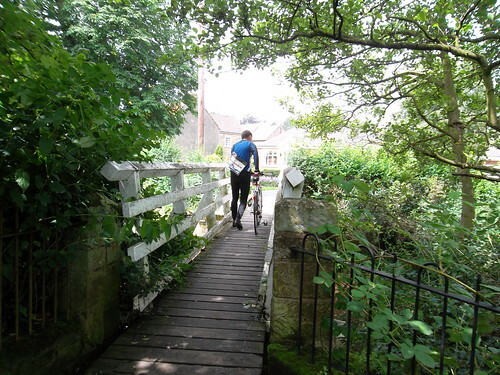 Dave and I pressed on to our next stop at Osmotherley and the climb after Swainby. In Osmotherley they were enjoying a summer fair. I ordered yet more beans on toast whilst Dave ate his sandwiches next to one of those fairground attractions that involve the punters hitting a sensor with a huge hammer in the hope that they can ring a bell. What with the Osmotherley brass band a few yards to his right I doubt whether he could have found a less restful place to hope to enjoy his refreshments. I was severely dehydrated and emptied the remaining contents of my water bottle before the waitress came to me. I asked her to fill my water bottle and I drank a litre and a half of water whilst my coffee cooled. She filled me up again when I paid for the meal. After too long a stop we set off towards Helmsley over the fabulous Moors road. Shortly after Hawnby we took a different route from the one I had followed a few weeks earlier. I thought the roads would be more forgiving, but actually they felt harder, and were certainly busier. We also came out on to the B1257 much further away from Helmsley than I had done last month. I didn't enjoy riding such an undulating B road. We didn't stop in Helmsley and took the A170 before turning right towards Harome. It was now baking hot and time for a strip down to short sleeved road jerseys. Although the route between Helmsley and Slingsby is fairly flat it certainly isn't featureless and I did enjoy these mainly quiet country lanes, with their high hawthorn hedges protecting us from the easterly winds. Dave would probably have covered 300km himself on the day, but we cut some corners and took the B1237 east from Slingsby instead of heading south towards Castle Howard. This knocked off a few miles, but we were both ready for another stop outside Morrisons. By this time the chairs outside a (closed) cafe had dried out and we took our penultimate break before heading towards Settrington. I swear I was thinking about how we hadn't punctured when I felt my rear tyre deflate beneath me. Fifteen minutes later we tackled the last remaining significant climb – out of Settrington – and on towards the Luttons. From there it was Driffield, Skerne, Hutton Cranswick and all the usual suspects back to Cottingham Green. Posted by Chris on July 13th, 2012. Well done Chris! That is a serious amount of miles – I'm quite happy with that as a week's mileage! Yes very impressive. I have never done a ride of that length and to be honest I have no desire to, I don't know how you keep up the motivation, mile after mile. On our club runs last year I have regularly notched up over the 100 mile mark and I now think that is too much. I'm fine doing the mileage but when I've finished I'm good for nothing but also sleep badly that night. I thought it was just me but on further investigation I found others who felt the same but were keeping quiet about their concerns on the pace and distance. I regard my self as pretty fit and can run and swim well with plenty of stamina and good lungs so I hit google with my concerns. I came across an article by a leading cardioligist who was totally against long distance running and cycling. He said that these activites in later life [40 and above] could lead to significient heart scarring and a shortened lifespan. He of course, advocated regular excercise and pointed out that an hour a day and within that some sharp bursts of effort to stimulate the heart, but that was plenty for a healthy heart and lungs. Food for thought, for me anyway. I must admit I feel totally different after a comfortable 60/70 mile run at a nice pace rather than a 100 mile dash. Thats my feeble excuse anyway. ... which is one (but not the only) reason I will never be a long distance cyclist, or even an Audaxer. This is serious cycling Chris. Well done. You might need to ease off a bit next time we go for a ride. I can relate to what Jim says about motivation mile after mile. After 80 I've had enough cycling for one day. However, the 'heart scarring' thing would not be a worry to me. Of course I am not a cardiologist but I would guess that keeping a steady pace over a long period would not be harmful to a fit cyclist. It would be interesting to know one's pulse rate after several hours at 10 mph. Tour de France stuff where you are cycling 150-200 miles each day for three weeks with a significant proportion of it at your limit, then yes, I can imagine some damage somewhere. Food for thought, 'tis true. 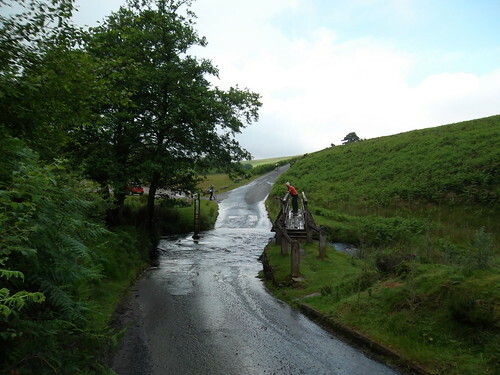 Good luck with the 2012 Big G Cylosportive – Grimpeurs des Wolds. This is next Saturday isn't it? You'll eat the 100-kilometre route. Phew! Is all I can say, I can't say I'm into sportives or audax, the idea of doing such a ride is very attractive to me, but I'm a slow rider, and couldn't face the ridicule. I don't think I have the physical ablity or mental strength to achieve what Chris has done but I'm probably too lazy anyway. I've done a 62 mile club run, in good company, today that I enjoyed very much. I do realy like the two guys on this website and it is my kind of cycling, though I like to think I can do a bit more mileage. But it is a lovely website. A certain charm to it. I reckon long distance cycle rides aren't going to damage my health. The key is to take it steady. I suspect those people in that report are the ones who complete ultra distance events at or near maximum effort. They are unlikely to stop off every thirty or forty miles for a pot of tea, beans on toast and lemon drizzle cake. I've never been in to racing. For me it's much more about the scenery. Which is why I'm in the Cyclists' Touring Club. Oh, the company is important too. Patrick wrote: You'll eat the 100-kilometre route. A bit of an inspiration, that Dave. Best part of that post? Hull fc losing!! Are you planning this route to be a perm ride or an event ride Chris? Well done by the way organising such a route, looking good. Er, I don't know, Mary. I haven't looked in to it properly. What would you suggest? To sort out a ride as an event, seems to require man-power on the day. 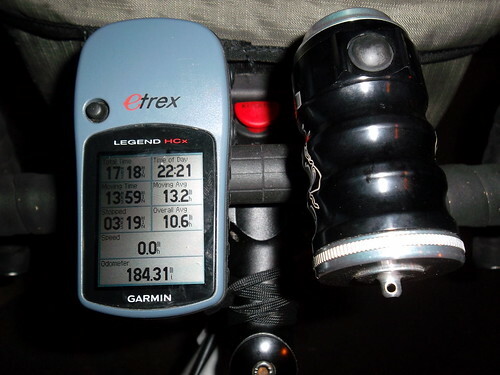 Folk to man controls, folk to sort out Start Brevets and Finish Brevets (although these can be done by ATM's or Shop receipts). Advantages of Perms of course, is cyclists enter and go when they like. Events are more social affairs. If your ride isnt hilly, I might fancy doing it next season if Im well enough. I am currently having a go at the RRtYear Award and intend to ride a 200km each calendar month, so I hope to be fit enough for a 300 next year. If you fancy sorting out your route, email John Ward from Audax UK (email in the handbook, or I can forward it to you if you wish) and he will take you through the process. Chris – beautifully described route. The Lion Inn is a favourite of mine as is the cafe in Kildale – the Glebe – which still does wonderful soup. It was nice to reminisce as I read your blog. I also agree with you that long distance cycling isn't a health risk if you're toddling along at a mildly raised HR rather than stress level HRs. (My opinion – no medical evidence so could be totally wrong). Organising slightly complex rides for audax has become much easier now we have the option of specifying mandatory routes. God bless you. Graeme.